Healthy eating is vital for the body but the need to maintain a balanced diet with all the essential minerals is even more important during pregnancy or when one wants to become pregnant. As much as you try to eat all the necessary foods, there will still be some nutritional gaps in most instances. These nutritional gaps are what make it necessary for women hoping to become mothers to take prenatal vitamins. Prenatal vitamins are pills that contain vitamins and minerals, and their primary goal is to bridge any gaps that the foods and drinks that you consume might not be able to fill. There are different types or brands of these pills on the market, but it is important to know the best supplements, when to start taking them and what to look for in any prenatal vitamins that you intend to use. When Should Mothers Begin Taking A Prenatal Vitamin? Most if not all women know and understand the importance of taking prenatal vitamins. But, many of them seem to have a hard time choosing the best ones, and this is more so during their first pregnancy. In some cases, your health caregiver will recommend a specific brand of prenatal vitamins which is always a good thing as it means that you get something that is suitable for your particular needs. Prenatal vitamins are a must take for any woman who wants to remain healthy during pregnancy and after delivering. This vegetarian one from Garden of Life has elements that will benefit both the mother and child. The capsules have some ingredients that are useful for supporting nutritional requirements for the developing baby and mother. They have Folate which helps in neural tube development, Iron for the reproductive system and blood health, ginger to deal with digestion issues and morning sickness and Vitamin D3 for ensuring optimal absorption of dietary calcium. And you get an amazing 180 capsules in the pack which ensures that you get value for your money which is one of the things that make them the best prenatal vitamins. Garden Of Life prenatal vitamin is a raw supplement without gluten and is suitable for vegetarians. There are no fillers or binders on this product. This supplement is also suitable for meeting a mother's nutritional needs after childbirth. Every mother will like the fact that the supplements also promote heart and blood health. It is useful in the promotion of immune system and neural tube health. This vegetarian multivitamin does not have petroleum or dairy based products. Unlike some other supplements, it does not leave an aftertaste after swallowing. It is a non-GMO prenatal multivitamin supplement. There are some herbs in the supplement that can affect female hormonal balance. They have a strange flavor as you are swallowing and it will take most women some time to get used to it. Three pills per day seem a little bit too much, and it is easy to skip or forget some doses. These supplements will not provide any protein which is one of the things that a pregnant woman needs most. 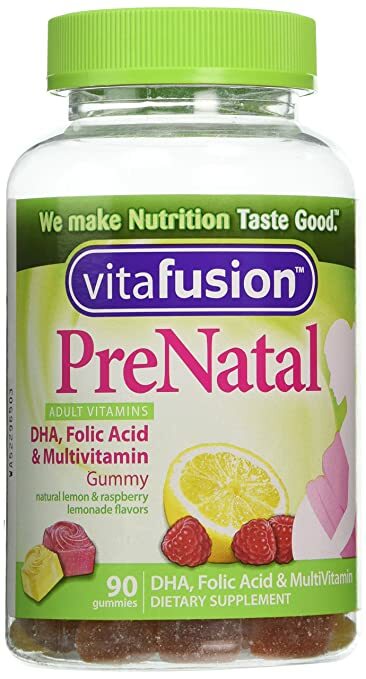 Vitafusion gummy vitamins will change the way most women view prenatal supplements. Instead of the traditional annoying pills, they are some tasty and chewable gummies which will not only benefit a pregnant woman, but they are also enjoyable. They are a rich source of folic acid and vitamins A, C and D. Also, they contain a significant amount of omega-3 fatty acids, and so they will also benefit the heart and brain. Vitafusion gummies are tested in the laboratory to guarantee quality and potency which means that you will be taking something that is sure to work as intended. And to top all these good things up they have some natural colors and flavors. The fact that the tablets are chewable makes them easy to use. Vitafusion prenatal vitamins taste better than most others. They have most if not all the vitamins that a pregnant woman needs. Unlike most other prenatal vitamins they are easy on sensitive stomachs. The supplements have some natural colors and flavors. This prenatal vitamin also contains omega-3 fatty acids which are good for brain and heart health. Vitafusion gummies are very affordable, and you will hardly find anything better at the same price. They do not have any iron. Although they are tasty, they stick on the teeth which can be annoying. Some ladies complain of a weird aftertaste when they take the gummies. Prenatal One Multivitamins is one of a kind supplement that is rich in nutrients that are important for expectant and nursing mothers. This multivitamin has folic acid and iron which are what gives it its therapeutic potencies and a potent vitamin B-complex that gives moms energy and helps them deal with stress. Calcium, vitamin D, and magnesium are the other compounds that contribute to making this one of the best over the counter prenatal vitamins. Prenatal one has probiotics and ginger juice that make it easy to digest and gentle on the stomach. 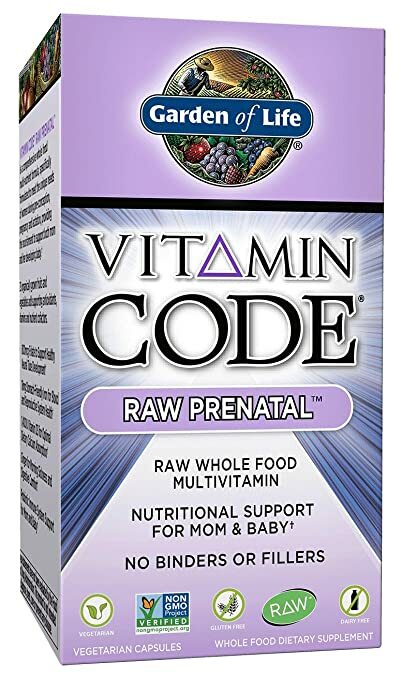 Apart from all this, the prenatal vitamin does not contain any yeast, sugar or gluten. 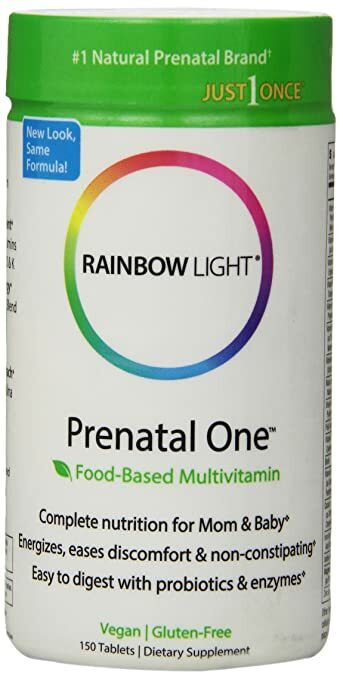 Rainbow Light Prenatal One Multivitamin contains probiotics and ginger juice which help to soothe the digestion system. You only need to take one pill per day. This multivitamin does not include any preservatives, flavorings or artificial colors. It is vegan or vegetarian-friendly meaning that any woman can take it. The manufacturer assures that it is 100% natural without any human-made chemicals. You do not have to spend a lot of money on it during your pregnancy as it is an inexpensive multivitamin. It is a very affordable multivitamin. The pills are bigger than most of the traditional prenatal multivitamins. Some ladies will find them hard to swallow without drinking plenty of water. The folic acid on this prenatal supplement is not in folate form. It contains the palmitate form of vitamin D which can be toxic to a fetus. 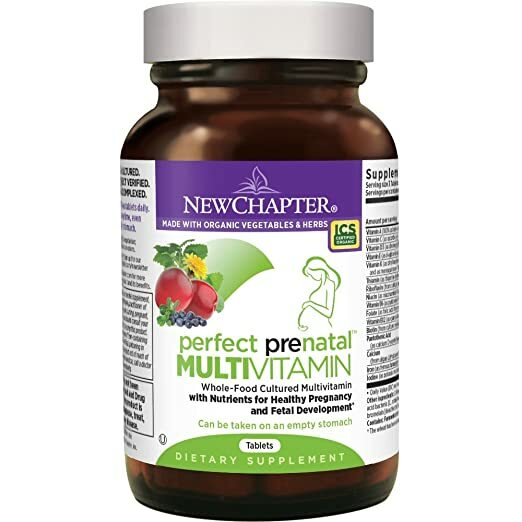 Perfect Prenatal from New Chapter has been carefully and expertly formulated to cater for the need of the mother and her unborn child. They help to bridge any nutritional gaps before conception and during pregnancy, and this is why many moms consider them to be the best organic prenatal vitamins. These multivitamins are from organic vegetables and herbs, and this makes them safe for both mother and child. They are also gluten-free and non-GMO, and most moms will love the fact that they are gentle on the stomach meaning that they can take them without eating anything. Also, they are complete prenatal vitamins with folic acid, iron, zinc, and vitamins B, D3, C, and A. You will not get any nausea when taking these prenatal vitamins. There is no constipating with these supplements, and they always leave you feeling energized. They support preconception, fetal development and help to ensure that you have a healthy pregnancy. Perfect Prenatal has compounds that help with everything from the baby’s heart to spinal and brain development. It is an organic prenatal, and this makes it 100% safe for both mother and child. You can take the supplement on an empty stomach as they are very gentle. The tablets are gluten free and non-GMO. There are some complaints about the new version of the prenatal vitamin containing magnesium stearate. You have to take three tablets every single day. 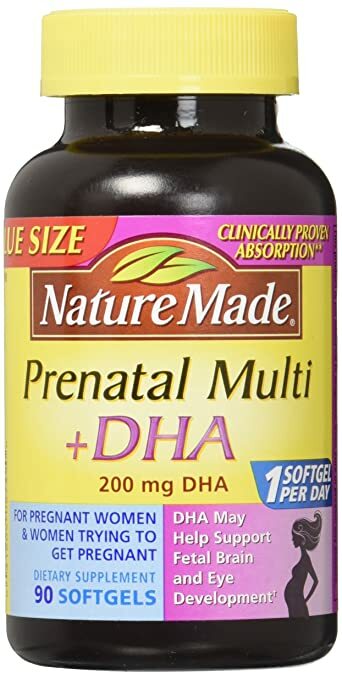 Perfect Prenatal does not have enough folic acid of DHA. It is an expensive product, and you have to spend a lot if you intend to take it before and throughout your pregnancy. This multivitamin supplement from Nature made contains some essential omega-3 fatty acids that support the healthy development of a baby and help to maintain the health of the mother during pregnancy. Their formula is for ladies intending to get pregnant and those who already have a baby in their womb and want to take the best prenatal vitamins. Nature Made Prenatal Multi contain essential nutrients such as iron, DHA, and folic acid which are vital for a healthy pregnancy. The supplements come in the form of soft gels to make it easy for moms to swallow and they do not contain any artificial colors, flavors, preservatives, yeast, starch or gluten. You only need to take one every day. Nature Made Prenatal Multi Vitamin can help with fetal eye and brain development. These prenatal vitamins a mother's immune system, bone health, and cellular energy production. It does not cause nausea or upset a mother’s stomach. Their absorption is proven clinically. The tablets do not contain any artificial color, yeast, starch, flavors, preservatives or gluten. They have a fish smell and taste which most moms will not like. It lacks a few essential minerals and vitamins that ladies need during pregnancy. These pills are quite large which can make them hard to swallow for some women. Just like most other multivitamins, they have a bad aftertaste. Besides from trying to figure out the best prenatal vitamins, most ladies will also have a difficult time determining when to start taking them. The difficulties come from the fact that there are varying opinions on the right time to begin consuming these essential pills. But, you should never have trouble determining when to start taking the pills because doctors and other experts recommend that ladies should do it three months before getting pregnant. Although you cannot be certain when you will get pregnant, experts will advise that women should start taking these prenatal supplements before they start trying. Prenatal supplements are available as either prescription or over-the-counter medication, but the most important thing is to know what to look for so as to get the best. The formulation of these supplements will in most instances vary from one brand to the other, but the following are the essential minerals and vitamins to look for before deciding on the supplements to buy. We also have buying guide about B﻿est ﻿Pregnancy Pillow if you want to take a look. Iron is an essential mineral that you should ensure that you have enough of for a healthy pregnancy. Apart from helping to prevent anemia, it is also critical for development and growth of your unborn child. Getting enough of it is vital as it almost doubles your blood volume and this ensures that your kid gets the necessary nutrients and oxygen. A supplement with 30 mg iron is perfect, but your physician might recommend you get more if you have a deficiency. Research shows that there is a link between better birth outcomes and Vitamin D. And so, it is imperative for moms to make sure that they take it as part of their prenatal supplements. This vitamin has numerous pregnancy benefits that include supporting healthy blood pressure and helping in the absorption of calcium. The aim should be to take between 400 and 800 IU. You should never buy any prenatal supplements that do not contain folic acid as it is one of the principal purposes why you need to take them. Anything that contains between 400 and 800 mcg of folic acid is perfect for ladies that are planning to get pregnant. However, it is always necessary to talk to your doctor because he might recommend that you take supplements with up to 4000 mcg of folic acid if you have given birth to a baby with Spina Bifida (or other neural tube defects) in the past. Magnesium is essential for the development of a child's bones. It also has multiple benefits for the mother such as relieving aches in the muscles, improving energy levels and research also shows that it can help in relaxation. A prenatal vitamin with about 400 mg of the compound should be ideal for most individuals. Babies need calcium in all the stages of development when in the womb, and they will take this nutrient from their mother. Calcium is essential for many reasons, but bone development and growth are the key ones. It is for this reason that mothers should get enough of it every day which is about 250 mg according to health experts.